Empowering the next leaders in healthcare. Help prepare the physicians of tomorrow. The UVA School of Medicine has a well-deserved reputation of graduating compassionate, thoughtful doctors who become leaders in their field, improving patient care and expanding medical knowledge. We changed how medical education is delivered, by designing a next generation curriculum and state-of-the-art space that has influenced other medical schools across the country. There's more to be accomplished. Our Medical Scientist Training Program readies young doctors to lead breakthrough research efforts, and our medical students graduate with real-time hospital administration experience. The School of Medicine also offers a robust scholarship program, and our endowed professorships ensure faculty have the time they need to mentor students and pursue leading research portfolios. A gift to support medical education is an investment in advancing cares and accelerating cures. Anne Watkins, Asst. VP & Chief Development Officer, School of Medicine. The School of Medicine has partnered with the McIntire School of Business to offer PhD and joint MD and MS degree programs. Your support prepares medical students with the the business experience they need to help shape America's healthcare system. A PhD, clinical and research credentials, personalized mentorship opportunities—these are the attributes of UVA's Medical Scientist Training Program, which grooms young doctors to excel in the lab and at the bedside. Medical school tuition is expensive, and even though the UVA School of Medicine has frozen tuition for the past several years, it's not enough. Philanthropy is a critical component to ensure the best young minds can follow their dreams. Learn more. Not only do endowed professorships help UVA attract and retain nationally renowned experts, they are structured to afford School of Medicine faculty time to balance research, teaching, and mentorship. Learn more. Health care relies on increasingly sophisticated devices for implanting into the body or monitoring it. Yet most med school graduates are not versed in engineering. That needs to change. Some of Virginia's top brain scientists have gathered at UVA to present the latest developments in the treatment of traumatic brain injury. 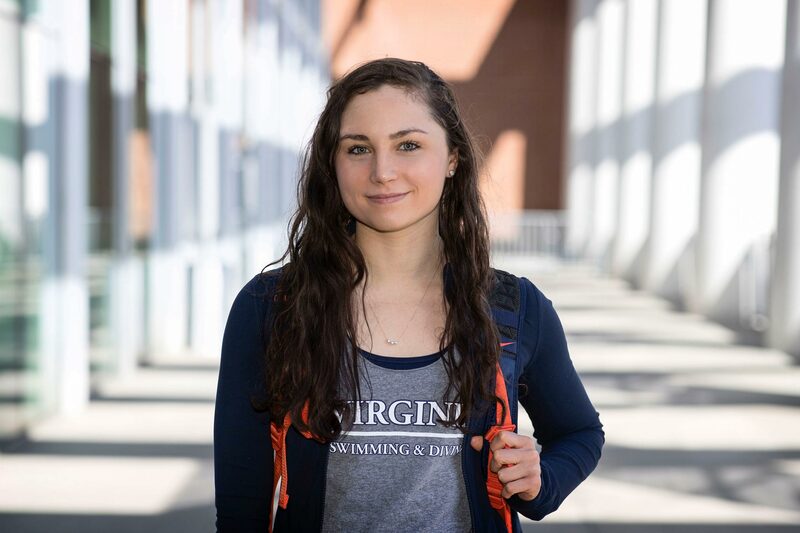 Fourth-year Rachel Politi, who has been instrumental to the UVA swimming team’s success as a captain, is set to attend UVA’s School of Medicine.